FRANKLIN, Mass. - That’s one way to strike back. Nearly one month ago, Franklin manhandled Mansfield in a 52-40 road victory. On Friday night, Mansfield returned the favor. Behind 14 points from Max Boen, the Hornets dominated from start to finish en route to a 60-43 victory over Franklin at Franklin High School. The win is Mansfield’s ninth straight dating back to January 13th. The Hornets (16-2, 13-1 Hockomock Kelley-Rex) proved to be efficient on both sides of the ball. At the defensive end of the floor they held Franklin (14-4, 12-2 Hockomock Kelley-Rex) to just 29 percent shooting. 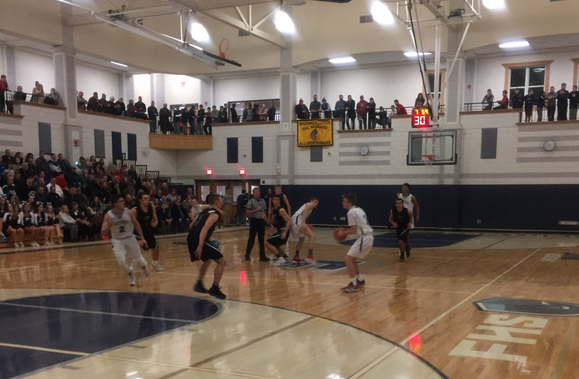 When it came to the offensive end, meanwhile, Mansfield received a balanced attack with Phil Vigeant, Christian Weber, and Sam Goldberg all scoring 12 points to go along with Boen’s 14. Mansfield proved that this contest was going to be far different from the first one from the opening tip. Boen knocked down a pair of three pointers, and Goldberg drilled a three from the top of the key to hand the Hornets a 17-6 lead after one. Hornets coach Mike Vaughan said he thought his team’s fast start to begin the game was the difference. The Hornets continued their hot start into the second quarter, with Vigeant pouring in five consecutive points to keep them up 10. Connor Goldstein (21 points), however, helped Franklin stay within striking distance as his 12 points in the frame brought the Panthers within 31-24 heading into the break. Franklin continued to chip away at Mansfield’s advantage to start the second half. Josh Macchi began the frame by finishing on a break away layup, and a Jalen Samuels and-one cut the Franklin deficit to just four. Mansfield had a response to the Panthers early third quarter run, going on a quick 9-0 spurt to get some breathing room. Boen got the run started with a foul line jumper, and then followed it up by finishing at the rim on a backdoor cut to put Mansfield up eight. Moments later, Sam Goldberg (14 points, 8 rebounds) made his presence known tapping home a put back to give Mansfield a double-digit advantage. Finally, Tyler Boulter capped of the run with a driving layup handing Mansfield a 43-32 lead heading into the final stanza. Mansfield opened their lead up to 14 on a Weber backdoor basket, but the Panthers cut it to single digits on a three by Goldstein. Vigeant immediately answered for the Hornets, though, splashing a three of his own. The dagger came with three minutes to play when off a Franklin turnover Vigeant hit a floater in the line to give Mansfield a commanding 54-37 edge. Mansfield has an opportunity to clinch the Hockomock Kelley-Rex League title with a win over King Philip on Tuesday night, but it is clear by the way they are playing that they are after a much bigger prize.